Move beyond your stuck-ness and live in the wholeness God has given you? Practice Biblical life-skills that will allow you to challenge negative thinking, let go of negative emotions and make way for more healthy and loving relationships? Become more compassionate towards yourself and others? Find the courage to take new risks and move through failure? Acquire the confidence to speak your thoughts and feelings constructively? Deepen your relationship with God and others? Find freedom to become all God made you to be? Working with a coach can help! For more information on my three (3) and six (6) month coaching programs, click here to get started with no obligation and submit an inquiry to see if coaching is a good fit for you. Coaching is a relatively new profession. It began in the 80’s but has grown significantly in the past 30 years as more and more people recognize its value. It is not covered by one’s medical insurance but sometimes covered by employers, especially with career coaching, performance coaching and/or executive coaching. In order to understand coaching, it can be helpful to think about a sports coach – which most people are familiar with. A sports coach helps a player gain the skills they need to enhance his or her performance. The coach also provides encouragement, accountability and structure so that the athlete develops to his or her fullest potential. In the same way, personal coaches and relationship coaches work with people who want to enhance their current life but lack specific skills necessary to make it happen. They may be stuck and not able to get the progress they want. They need accountability and structure in order to get results. When a person hires a coach, he or she needs more clarity, greater confidence, better direction, and accountability to reach desired goals. Coaches are action oriented. They come along side someone who has specific goals to help a person get reach those goals. They aren’t necessarily dealing with someone’s past issues or something that is “wrong.” Rather they focus on what impedes someone’s progress to move forward. Most coaches are not counselors but have been trained in the process of coming along side someone and helping that person move toward a desired result. Coaching is distinct from counseling. Counseling focus on feelings while coaching focuses on action. Counseling focuses on weaknesses and deficits while coaching’s emphasis is on strengths and assets. Despite these differences, many counselors see the value of incorporating coaching into their practice, (as they may already do some of this with their counseling clients). Hiring a coach has nothing to do with having deep psychological problems or dysfunctions, but everything to do with wanting to become all that God has called you to be. Sometimes when there is an overlap, a coach that is also a counselor can help someone through a short bump in the road, but if the client becomes emotionally unstable, overwhelmed, depressed, or unable to function, he/she is referred to a counselor. That doesn’t mean the coaching can’t continue, but the coach doesn’t do the counseling. Get Started with no obligation – just submit an inquiry to see if coaching is a good fit for you – I look forward to exploring your coaching options with you so you can be on the road to more clarity, happiness and fulfillment! Enhance your speaking and writing platform to clearly express what you do and who you help. Then Click here to schedule your no obligation, personal consultation to see if coaching would help you get to the next level. 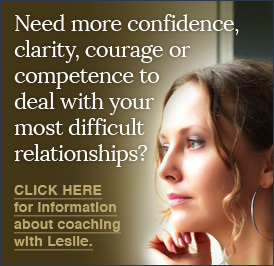 Look at the great results people achieved from coaching with Leslie!The coaching sessions have been an eye opener for me and surprisingly superior to some of the counseling I have received in the past. I think the limited distractions of travel time, person and place allowed me to focus more on what you were saying, hear you better and get deeper into my own experience. Your style is objective and goal oriented and yet you are very empathetic to the pain experienced and the slow process of growth. Some of the conversations are still alive in my memory and are a source of continued encouragement towards my stated goals. I gained a lot from the sessions because they were Christ centered, focused, relaxed and profoundly effective. Thank you so much. Wow! I am so grateful for the opportunity to work with Leslie. I learned not only to recognize, but to deal with, some life-long struggles. I feel more confident in my ability to make decisions (a BIG thing for me!). I feel that I can move forward in this phase of my life better because I have some tools that I did not have prior to working with Leslie, whether they are for personal growth, marital/family relationships and life in general. 3) Looks at all of life from a biblical perspectiveI''ve gained clarity as I''ve spoken with Leslie about my difficult marriage and issues with my children, and feel better able to move forward with confidence and a renewed perspective after working with her. I highly recommend the coaching program! "Leslie has a gift of asking the right questions and pin pointing ''twisted thinking''. Much of my thought process stemmed from childhood and was made worse with an emotionally abusive man. She coached me, and coaxed me to find out what was keeping me stuck.By the time we finished our first ''phone session'' I had a new key to life and who I was!I could write on and on about how grateful I am for all you have done!" 50 year old Interior designer who was stuck in her business and life. "I'm able to be more present without feeling anxious, I'm setting better boundaries, I'm communicating more clearly, I'm not procrastinating, especially in the areas of conflict, I'm more organized at home, and I'm just enjoying being alive. Thank you." "Underneath massive changes have been taking place in my life and more importantly in my understanding of the problems and limitations within which I am functioning. You have helped me tremendously to see more clearly where I have obstacles over which I must overcome, both, internally and externally.Considering my circumstances, I cannot have imagined anyone else who could have helped me in the way you have helped me. Your coaching, encouragement, wisdom, insight, perspective and prayer have been an answer to prayer for me. Thank you."